On the slopes of Uva where the frontiers extend to the "nine hilltops" appropriately named Namunukula, there lies a lost temple in the valley of Haputale called Kande Vihare traceable to period of King Valagambahu. The universal pilgrim progresses on the belief that acquisition of merit is proportionate to the hazards of the journey. Yet no faithful were encountered on the long trek. The poverty around had emptied the pilgrims purse. The rock stands as the focal point of the cave temple and at the entrance is an enchanting pool with a waterfall where the foaming waters flow down to Kirindi Oya. Clinging to the rock are the remains of an ancient ambalama  for the weary pilgrim to cleanse and refresh himself before entering the temple precincts  discreetly partitioned for the needs of the genders like the contemporary changing rooms at beach resorts. A bare bodied man was working diligently attending to repairs to the brickwork on the ground. He disappeared on sighting us to reappear in robes. Such monks require attributes more than spiritual to survive. The cave temple, coming under suzerainty of the historic Dowe Temple, yet older, would have been taken over by the jungle tide if not for its preservation by the order in saffron. Still unspoilt and untouched this vanishing breed fortunately have not been visited by the elements of sophistication or spoilt by the born again Buddhist politicians who seek to turn temples of fame to temples of shame. These saints of politics are easily identifiable by the bracelet of white pirith thread around their wrists to give a holy appearance and seek protection against sin. These monks are so unlike the flying monks of the tourist Nikaya whose mental faculties can comprehend federal constitutions, provided sightseeing tours are included in western capitals. Give them the comforts of a first class air ticket and they are prepared to travel even to hell. War Games and Peace Talks have provided a flying carpet for some monks and politicians of similar feather. The hard rock is the centrepiece and around it the temple has been conceived. 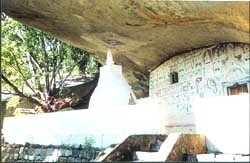 A shrine with a 32-foot Buddha statue in clay lies inside the cave. It is visible more by torch light than by the rays of the sun. The miniature dagaba is enclosed, with the rock as the protective hood. The preaching room is girdled by rock and wall. The visible tunnel  legend distances it to Dowe, is inside the cave. The trade marks of Valagamba  drip ledge and inscriptions are prominent on the rock. The monks sleep in the cave. Ironically their bedside companion is a dreaded loudspeaker. This instrument of noise pollution had been gifted by the villagers in the valley below the terraced paddy, to enable the elders to hear sermons without scaling the mountain. The temples and mosques with loudspeakers compete to deafen their faithful. It never happened in the past when we lived more in harmony than in bigotry. Fortunately, in churches only bells toll. The temple compound remains a high security zone safe from the hunters as long as the monks command respect. This HSZ may not be dismantled and is the last sanctuary for the many monkeys and the few deer in the absence of the dear monkeys who negotiate on our behalf from Bangkok to Berlin. The MoU between the hunters and the temple is secure due to the splendid isolation of the location  beyond the reach of the Pajeros which wends their way to Asgiriya and Malwatte. The beauty of the temple lies in its paintings. Some of the ancient paintings within had been garishly painted over. Following instructions from the Archaeological Department the monks have been enlightened and the paintings are preserved. The cave roof is decorated with motifs in sky blue  an embodiment of refinement. I am not a patron of the arts qualified to comment further. The preservation and restoration of these historical sites are in the hands of the monks in the absence of State support. The custodians of a historic temple with their bare hands and meagre resources safeguard this heritage due to strong belief in their faith and conviction. Being not a devotee of temples I enjoyed the trek even more. From Poonagala junction it is a comfortable down hill trudge on estate roads and then a safe walk along the edge of a cliff with a frontal view of Handapangala and the rice fields of Wellassa. The more gentle way to reaching the temple is to pass the vegetable growing village of Sardinawala. The dress of the village women showed glimpses of a purane village. The village kade was spared the decorations of visiting salesmen. The only visible infiltration was the disfigurement caused by a faded and tattered poster of an angelic looking candidate  possibly a local-thug  wooing voters at a local election. There were no holders of public office on this display in this hamlet. Mercifully the president and the prime minister were not up on the walls. The onward journey was interspersed with scattered patches of primeval forests and trees stunted by the ferocious winds. There were tempting streams inviting a splash cascading through the rock strewn course weaving its way to Walawe. The angry grunts of nasty wild buffaloes after a chance meeting made us climb trees for safety and exposed cowardice. Except for such jolts it was comfortable cruise on foot. For the return journey we decided to come from the back of the temple on a stream route known only to village lads in search of adventure. Duminda and Ajith  my young guides hacked their way through the thick jungle to make a path but at times lost their bearings and regained it through a familiar landmark. It was scenically splendid and had the typical Uva flavour, the waterways flowing along the many gorges in Uva Downs; The hills and valleys forming glens everywhere. The luxurious vegetation in splendid colour blended with the green patnas and fields of mana grass. Miniature waterfalls were too many to count. A comfortable commencement point to enjoy the splendour of Uva and its many valleys is the Mahakanda Bungalow*  a 35 minutes drive from Bandarawela reaching an elevation of 4200 feet. It has the trappings of a well maintained old world planters bungalow with the "bonus" of nightly visits by two wild elephants in search of sugarcane and bananas.